You can't get enough of 2020! the challenging puzzle game that took the basic idea of Tetris to a whole new dimension? There is good news for you! Here comes 2020! Winter Land! As in the popular predecessor you have to complete horizontal or vertical lines with given blocks to make all those blocks disappear. Whenever you place blocks on the screen you are awarded some points. Sometimes this can be enough to win a level, but of course you can score even more when forming complete lines. And you don't want to settle for less, don't you? 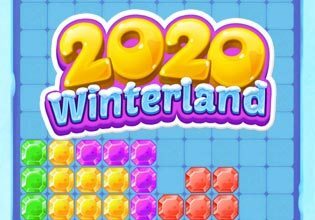 Play 2020 Winter Land now for free - 60 brand new winter themed levels full of snow, fun and challenges are already waiting for you!